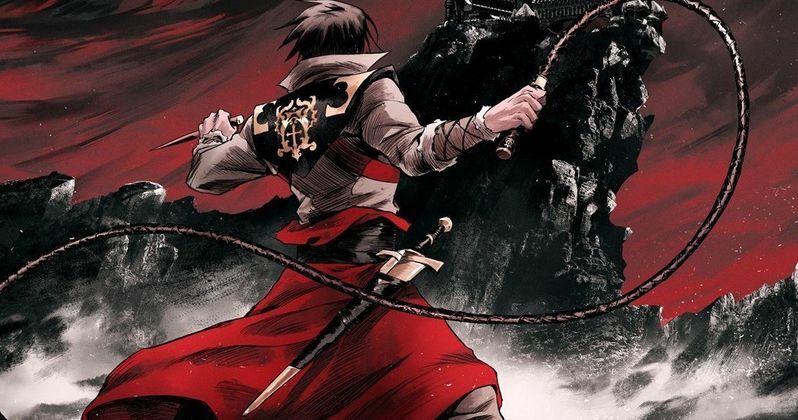 Netflix's Castlevania anime mini-series officially streams tomorrow, but you can hear the new theme song right now. The show is being produced by Adi Shankar, who had previously teased the show all the way back in 2015, and is written by Warren Ellis (Transmetropolitan, Global Frequency). The first season or Part One, will consist of four thirty-minute episodes with Part 2 coming some time in 2018. The recently released trailer gave us a quick tease of what we could expect with some dark and brooding music underneath, but as it turns out, that wasn't the actual theme for the show. The official theme for Castlevania comes to us via Nerdist and it sounds a little lighter compared to the music in the trailer. Possibly a little bit more eerie than dark and brooding, the theme song was written by Canadian composer Trevor Morris (The Tudors, The Borgias) and it features light orchestration with some backwards piano following a melody that is reminiscent of the original Nintendo game. Series writer Warren Ellis said that "Trevor is a master of his art: hugely innovative, yet with a deep understanding of early music, combined with a love of electronics, creating something weirdly primal but completely contemporary." Morris talked about his excitement for being offered the chance to work on the mini-series. He explains. "Being asked to contribute to Castlevania was such a great call to get. As a composer it's just a cool, colorful and interesting world to get into, and provides endless inspiration for music. It was just a fun and cool project to work on, I could score Castlevania for years and years." In addition to Netflix's Castlevania, Trevor Morris has scored Marvel's Iron Fist, which also streams on Netflix. Morris has directly collaborated with Jerry Bruckheimer and Neil Jordan as well as with Tony and Ridley Scott. Morris won an Emmy in 2007 for Outstanding Original Main Title Theme Music for The Tudors and he was nominated for The Pillars of the Earth. In addition to movie and TV themes, Morris has also worked on videogame scores including Marvel: Ultimate Alliance and Dragon Age: Inquisition. Inspired by the classic video game series, Castlevania is a dark medieval fantasy following the last surviving member of the disgraced Belmont clan, trying to save Eastern Europe from extinction at the hand of Dracula. British actor Graham McTavish (Outlander, Preacher) provides the voice of Dracula while Richard Armitage (The Hobbit) provides the voice of Simon Belmont in the mini-series. Though the series is obviously a go, the big screen adaptation was announced back in 2005 and has since gone through the ringer with no apparent news except for the fact that director Paul W.S. Anderson said that they're were licensing issues. The original Nintendo Entertainment System Castlevania game came out May 1st, 1987 in North America and earlier in 1986 in Japan. The game has been through many sequels and offshoots through all kinds of different gaming systems, mainly putting Simon Belmont to battle up against Dracula and other classic monsters like Medusa, the Mummy, Frankenstein, and more. Castlevania begins streaming on July 7th, but until then you can check out the brand new theme song here and watch the trailer below along with the poster gallery.